The majority of ties you’ll find are going to be made from 100% silk, but ties can also be made from silk blends, cotton, or even knits! Silk ties have a luxurious sheen that many men find appealing, and since silk takes well to often intricate patterns being woven into or printed onto it, so it has remained one of the most common materials used in making ties. Bow ties can also be made out of a variety of fabrics, though they are usually silk. You may have just noticed we differentiated between how the pattern is incorporated into the tie. Weaving the pattern into the tie is the most common manner of making patterned ties, but ties that are machine-printed are also quite popular. When it comes down to it, there is no functional difference between woven and printed patterns, apart from the woven ties having slightly more texture than the printed ones, and an allowance for more complicated patterning with the printing method. 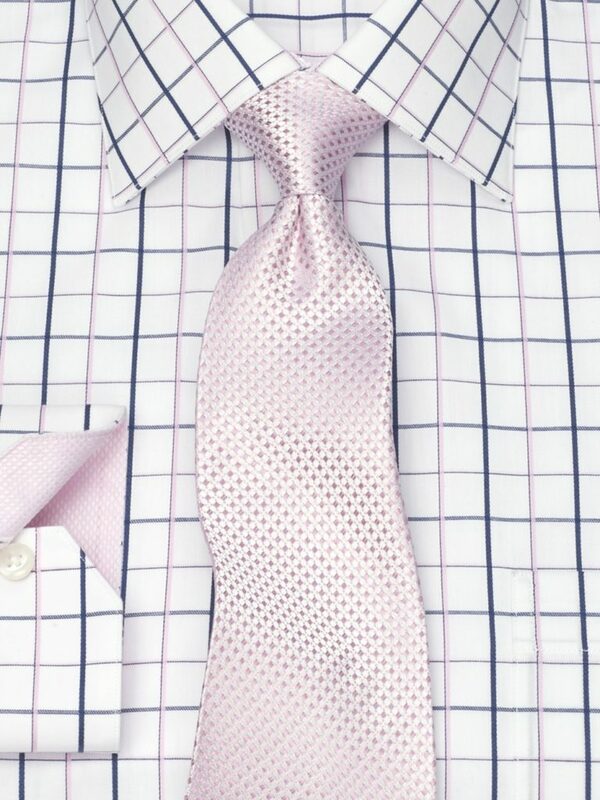 When coordinating your tie with your dress shirt, the general rule is to pair large with small. That is, if your dress shirt has a large-scale pattern, like a grid, for example, your tie should be in a small pattern, like dots or a mini paisley. The opposite also applies: if your shirt has a small pattern like a check, you’ll want a large-scale pattern like a paisley or stripe. There can only be one focal point between the two, so make sure they’re not competing with each other in a pattern or in color. 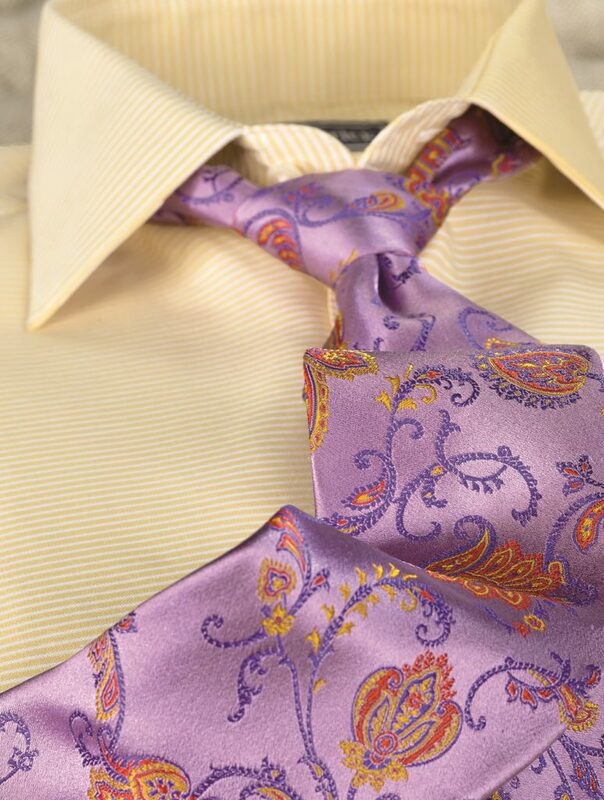 You’ll also not want to overdo either of these elements by using them for both your shirt and tie – just pick one! Something else you should consider is the length of the tie: all of our ties are offered in Regular and Long lengths. We recommend that men 6’2 and taller or those with a neck size of 17.5 or more purchase a Long tie. Solid is technically not a pattern, but we’re including it here anyway. If you’re not really sure how to match your shirt to your tie or you have concerns about what you’ll wear it with, a solid tie is probably your best bet. 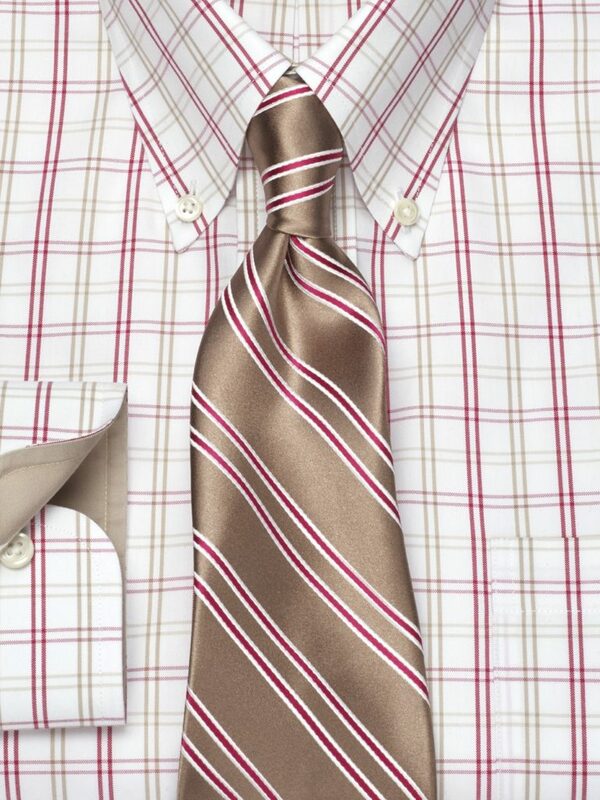 By solid, we mean that the entire tie is a single color and its silk surface is completely smooth to the touch. However, solid ties can also be textured. Texturing can give your look a little visual interest without having to commit to a specific pattern. Overall, solid ties are the simplest to match. Paisley is a swirled tear-drop shape pattern that can be found in a number of different sizes depending upon your preference. 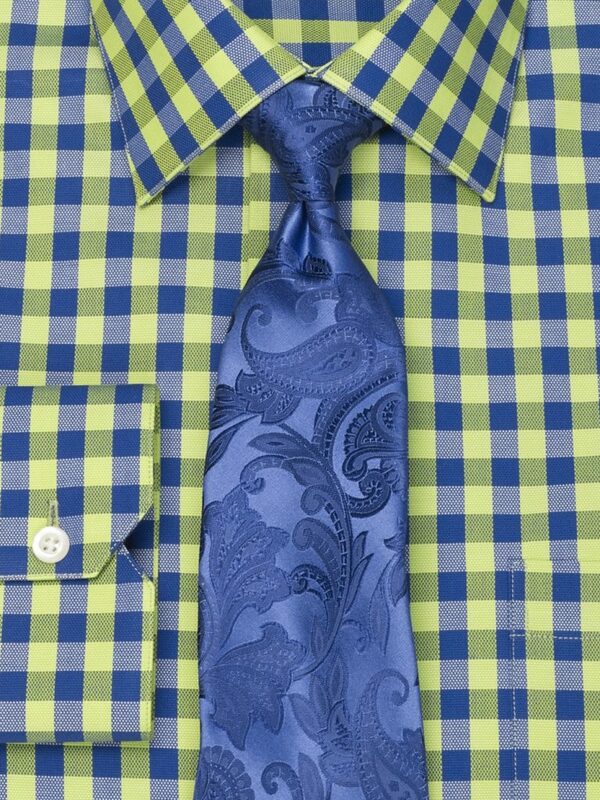 This pattern works well with solid dress shirts, checks, plaids, and stripes. 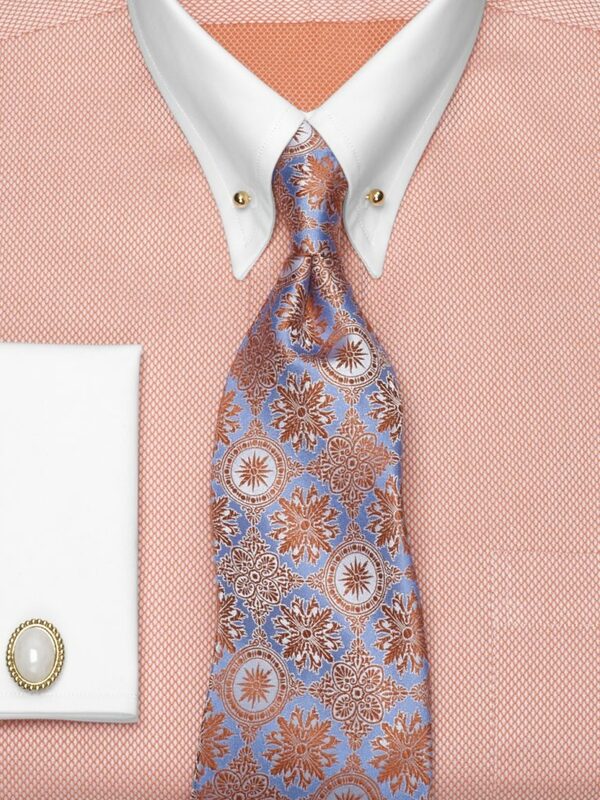 Depending on the colors within the pattern, paisley can be quite bold, so just keep that in mind when pairing it. 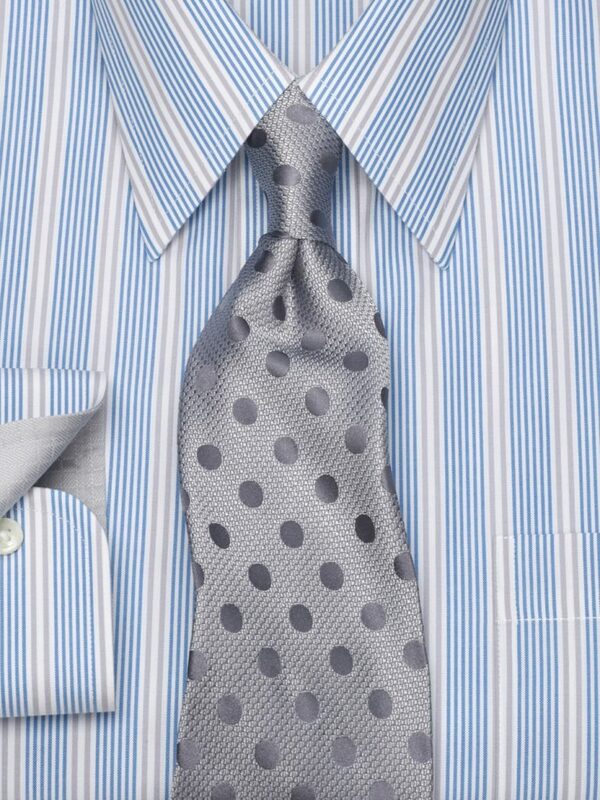 The stripe is definitely one of the most ubiquitous tie patterns out there. Choose from thick stripes, thin stripes, and even stripes with patterns on them. One very popular simple striped style is the Blazer Stripe Tie, a smart-casual accessory that looks great worn with a crisp dress shirt and blazer, as the name implies. Floral patterns refer to nature-adjacent designs like plants, leaves, and, of course, flowers. 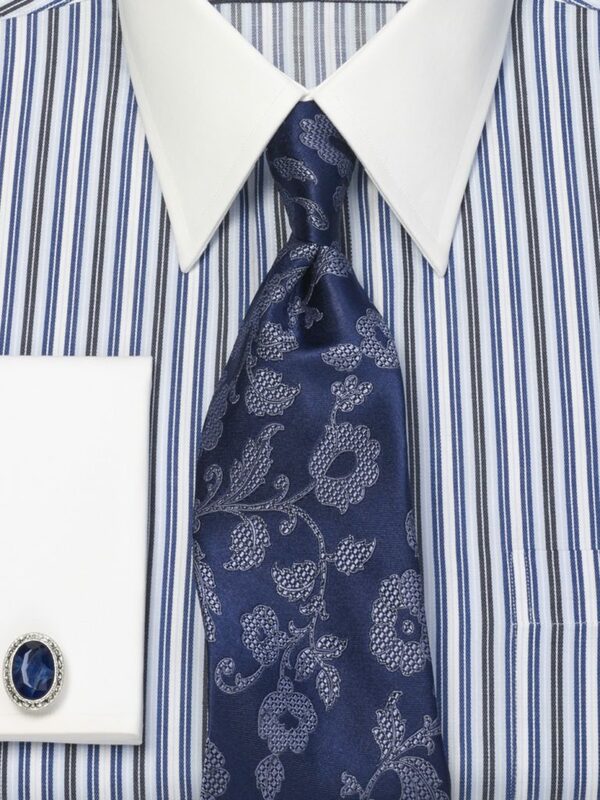 A very timely choice of pattern, floral ties are a wonderful addition to any Spring look. You might be surprised to learn that florals can be found in a variety of colors from more conservative to bright seasonal tones. Essentially, a medallion pattern features a specific geometric shape or design repeated throughout a piece. That design can range from a simple form like a circle or square to something more intricate, so a medallion tie can be quite conservative depending upon its coloration. The dot pattern is less serious than many other common tie patterns, and wearing one can certainly add a bit of fun to your look. You can tell whether dot ties fall under the large- or small-scale designations by considering the size of the dots and the spacing between them. These are the basic types of tie patterns you’ll encounter. Paul Fredrick offers additional styles, like houndstooth or novelty patterns, and you may come across combinations of more than one type. We highly recommend you check out our Tie & Cufflink Matching tool to discover even more ties that work great with your dress shirt. There are so many combinations to choose from, so have fun! I just spotted a Paul Frederick magazine in a friend’s tailoring shop and saw your website and looked up. My name is Rutherford Aniagyei-Sarkodieh. From Ghana. How can I purchase the beautiful multicolored tie against a yellow shirt shown in the expose about ties. Hello Andrew, I’d be happy to help you. But first, which catalog are you referring to? And is a Seafoam Green with Burgundy design tie. Please help me if at all possible. Thank you. Unfortunately, we are sold out of that tie and do not have any plans on renewing that style. We do have a few green ties this season that while not exact, may be close to what you’re looking for. Hopefully, you might find something suitable.